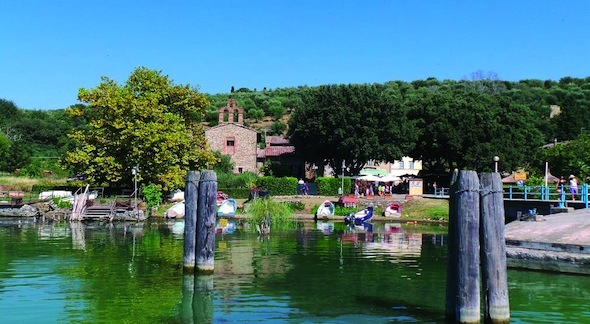 For your trip to the Trasimeno lake give yourself an excursion to the Maggiore Island. 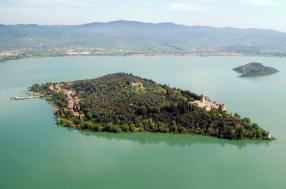 That is the richest of art places one among the three islands that characterize the famous Umbrian lake. Walk along the shores of the lake and relax on the small beaches with umbrellas and sunbeds, then traverse the paths immersed among the olive trees and the Mediterranean vegetation. Breathe the atmosphere of the past, admire the many testimonies of different and distant eras that have come down to us. 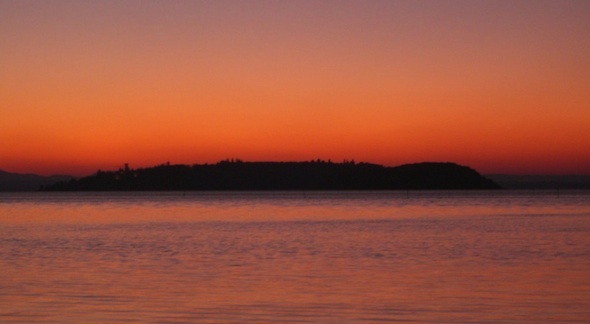 From anywhere on the island, enjoy the spectacle of colors at sunset, with the sun setting behind the hills that frame the lake and the thousand multicolored shades that fire up the sky and warm the soul. An excursion to the Maggiore Island is also recommended just to enjoy this wonderful natural spectacle. Discover the most enchanting landscapes and the unique panorama offered by the island. Maggiore Island preserves many testimonies of its ancient splendor, both civil and religious. In addiction of the naturalistic aspect, you can visit or admire the remains of the Roman era, various churches very different each other, the Guglielmi Castle, the places of Saint Francesco directly linked to the stay on the island of the saint of Assisi. All starting from the picturesque ancient fishing village, the first stop for those who come to explore the island. √ To discover what to see on the Maggiore Island -> read again below! Once disembarked from the ferry in the small mooring of the island, you will enter immediately in the picturesque village, which has maintained its appearance of a typical fifteenth-century fishing village. Fishing was the most common activity in the past in the Trasimeno area and it was here that the main fishing community of the whole lake stood, as evidenced by the small and colorful boats still moored nearby. Via Guglielmi, the main street which runs through the village, has been restored in the 50s and has maintained the typical red brick paving laid as knives. On the street, there are stone buildings of few floors, the old houses of the fishermen who once used to live on the island. 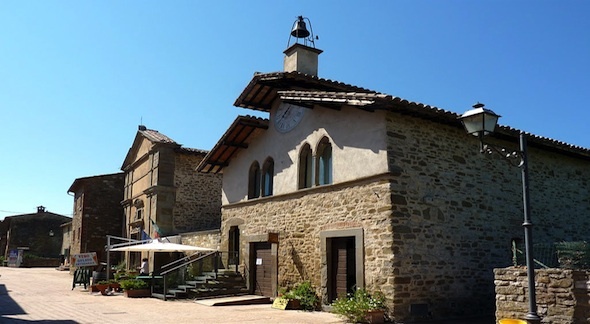 Going through the village, enjoy some stops to visit some fundamental sites of the Maggiore Island. Adjacent to the Church of the Good Jesus, this building is also known as the "Palazzo dell'Antico Orologio", due to the inclusion of the clock on the façade in the second half of the 18th century. 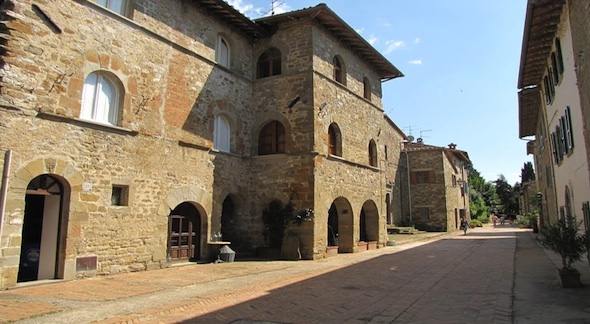 Il Palazzo is also built in sandstone and has evident Gothic features, which allow it to be dated to the 14th century. In all likelihood it constituted the summer residence of the "Capitani del Popolo", the Perugian notables who once administered the island, from which it derives its name. Today the palace houses an interesting documentation center on the history of the Isola Maggiore. You will find panels and graphic reconstructions that tell the economic activities and in particular the fishing on the island; ancient processional banners that testify to the numerous confraternities that were once present; works of art from churches located on the island, including a wooden crucifix probably made for the Church of San Francesco. Adjacent to the Palace, this small church was probably born as an oratory for one of the most important brotherhoods of the island. As you enter, you are facing the beautiful stone work that frames the altar with twisted columns and reminiscent of the famous canopy of St. Peter's Basilica in Rome. 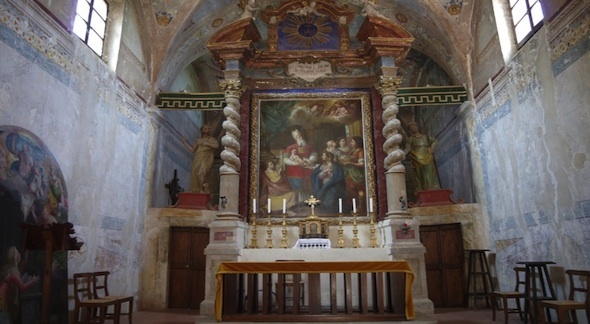 Inside, we find paintings by local painters including: in the center the "Presentation of Jesus in the Temple" by Anton Maria Garbi, an 18th century painter who is very active in the area; on the left the "Assumption of the Virgin and Saints" by Giacomo Giorgetti, painter of Assisi who made the work around 1630-40. Why a museum dedicated to the art of lace on the Isola Maggiore? Merit of the Marchesa Elena Guglielmi, who at the beginning of the twentieth century founded on the island a school-laboratory of embroidery dedicated to the daughters of fishermen. Here the girls learned the art of lace at "punto Irlanda", crocheting introduced by the marquise and performed in imitation of Irish lace, handed down in turn by the service staff of the family originally from Ireland. 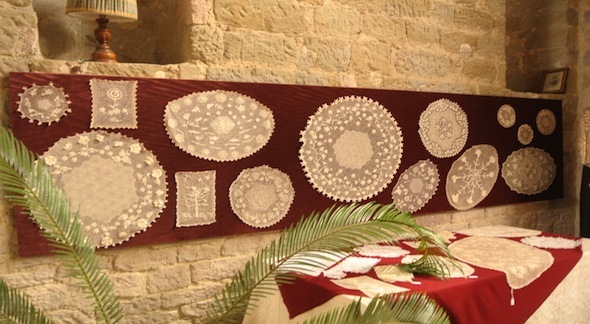 Today the Museum preserves the lace and embroidery works made by the lace makers of the island. The precious and significant collection of exhibited pieces, both antique and contemporary, impresses with the high quality craftsmanship of their workmanship. You can access the Museum in the Palazzo delle Opere Pie with a € 3.00 ticket. The Museum is open at the following times: from Easter to September every day 10: 00/13: 00 and 14: 30/18: 00; from October to November 2nd only on Saturdays and Sundays at the same times; closed from 2nd November at Easter. Maggiore Island hosted Saint Francesco of Assisi in 1211 for all 40 days of fasting and prayer of Lent, as reported by official documents of the time. His stay also explains the presence on the island of Franciscan friars already at the end of the thirteenth century, while one of their Convent will be built later, in 1328, and will later become what we know as Castello Guglielmi. There are three places that bear witness to the passage of San Francesco to the Isola Maggiore, today still a pilgrimage site for devotees and visitors. To reach them continue beyond the village on the left. 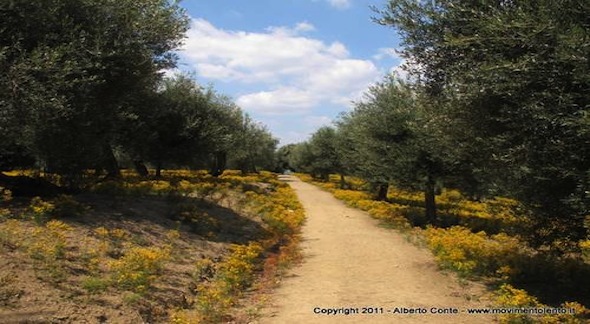 Leave the village behind you, follow the path "Lungo Lago" or the evocative "Sentiero dei Lecci", which plunges into the holm oak and pine woods, and crosses the island. This is the point where St. Francis set foot on the Isola Maggiore, the rock where the fishing boat that carried him landed. Legend has it that the marks of his elbows and his knees are still imprinted on the rock. In front of the rock, there are two small chapels dedicated to the saint of Assisi. The first was built to protect the source that is said San Francesco dug with his own hands, making water escape to drink. 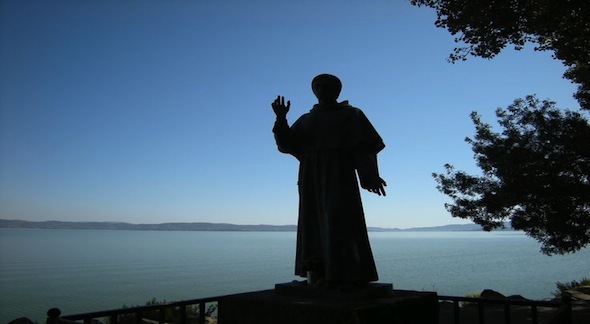 The second, a little higher, rises on the rock that made St. Francis during his stay. The statue was donated to the Isola Maggiore by the Franciscan friars of Santa Croce di Firenze in 1982. It is a bronze statue that depicts the saint and was placed right between the chapels and the rock, as evidence of the landing site. This little corner of quiet and spirituality is the most dear point to the devout islanders and to all the pilgrims. TRASIMENO LAKE IS WAITING FOR YOU!